That’s right boys & girls. Downtown Nashville just got a lot cuter. I was walking with a coworker to the Arcade to go to the Post Office (Dear USPS, please do not close this location), and we about stopped in our tracks when we saw this. After getting done with my errand at the Post Office, I quickly ran walked at a totally normal pace, into the shop. I was immediately greeted by the most WONDERFUL smell. Freshly baked cupcakes! I purchased two for sharing with my buddies. 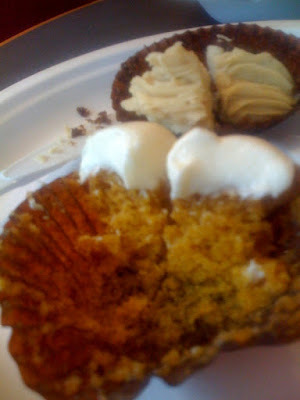 One was Carrot Cake with Cream Cheese Frosting, the other was Chocolate with Caramel Hazelnut Frosting. 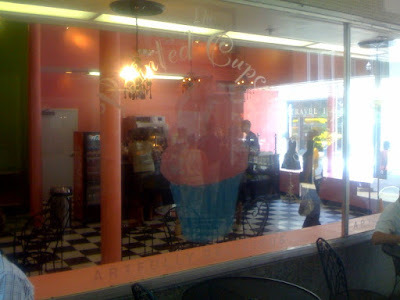 If you live or work downtown Nashville (or are a tourist) definitely check out Painted Cupcake. They were reasonably priced, some are $2.65 and some $2.95. And we all agreed it was the perfect amount of frosting, atop a moist & delicious cake. how many cupcake places are there in Nashville. do you think that this is just a fad? 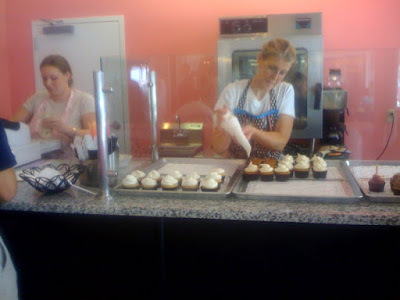 To my knowledge, there are three "cupcakeries" in Nashville. Gigi's, Cupcake Collection (in Germantown, haven't gotten over there yet), and now Painted Cupcake. Do I think this is just a fad? I think that having THREE in Nashville, might be a fad. But honestly I think cupcakeries are here to stay. They're cute, tasty, kitschy, & convenient when you just want 1 serving of cake. Also to my knowledge we seem to have more fro-yo joints popping up left and right. I wonder how many of THOSE will last. I've been thinking for a while that perhaps I need to do a blind cupcake taste test party at my house. I won't say which one I'm NOT a fan of, but I've often wondered if people would rave about them so much if they blindly tasted them…. Cuppycakes (delivery only, but I've been dying to try), Ivey Cake, Sweet Melissa's, Dulce, Sweet 16th, Curious Gourmet Cupcake Cafe, and ??? I just got back from NYC. Got a chance to visit the Magnolia Bakery while I was there. 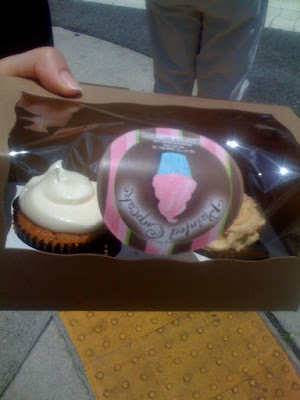 It was my first experience with a "cupcake shop" (since I pretty much live in the Boonies). It was wonderful, and so much fun! Would love to see something like this in my area. They look heavenly! 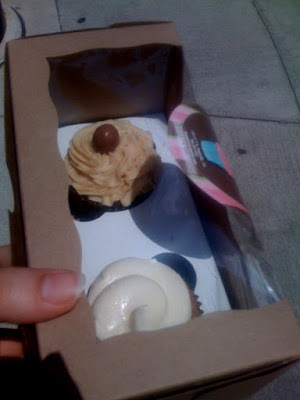 PS – I totally love the idea of a blind cupcake taste test!!! YUM!! I want one!!! We have a new bakery in the BG, called Imagine Cakes and it's pretty yummy… Sure beats Riley's! Will definitely have to go next time I'm in Nashville. WOW what a great place to visit. They don't have "cupcakeries" where I live.